Acquired by LightBay Capital and Freeman Spogli & Co.
3. LightBay and Freeman Spogli were represented by Proskauer LLP as their legal counsel. FASTSIGNS was represented by Kirkland and Ellis LLP and Greenberg Traurig LLP as its legal advisors, and by North Point Advisors LLC and Harris Williams & Co. as its financial advisors. Ares Capital Corporation and other affiliated Ares Management funds provided senior debt financing to FASTSIGNS in connection with the acquisition. 4. At the end of April 2018, FASTSIGNS announced its worldwide partnership with 1HUDDLE, a workforce training platform that converts unique training content into science-backed, quick-burst training games that are proven to accelerate workforce productivity. FASTSIGNS is the first in its industry to offer gamification as part of its support suite for franchisees. 7. Near the end of October 2018, FASTSIGNS signed a master franchise agreement to expand to mainland Spain, the Balearic Islands, and Gibraltar. Chris Kirby, an existing FASTSIGNS franchisee, will develop a minimum of 10 locations, specifically targeting initial development in Barcelona, Madrid, Valencia, and Malaga. 9. Kirby joined FASTSIGNS in 2016 when he acquired an existing center in Boca Raton, Florida. Since then, Kirby’s business has been recognized as a top-performing center out of nearly 700 FASTSIGNS locations worldwide as a result of increasing sales by 370 percent in the first year. Originally from London, Kirby realized the growing need for signage and visual communications across Spain and Gibraltar and is excited to spearhead the brand’s international growth in these markets. 11. FASTSIGNS experienced strong international growth in 2018, including opening 24 locations in the U.S. and Canada, one in Chile, and two in Australia. FASTSIGNS is continuing to seek qualified candidates to grow its international footprint in markets throughout the world, including Europe, Brazil, Québec, North Africa, Southeast Asia, India, and Latin America. 12. FASTSIGNS was founded in 1985 by Gary Salomon and Bob Schnanbaum in Dallas, Texas. Before starting FASTSIGNS, Salomon had visited a computer shop in Austin and saw how quickly the shop was able to produce vinyl signs. After promising not to open a competing business in Austin, Salomon and Schnanbaum convinced the store’s owner to train them on the new technology and signmaking techniques. 13. 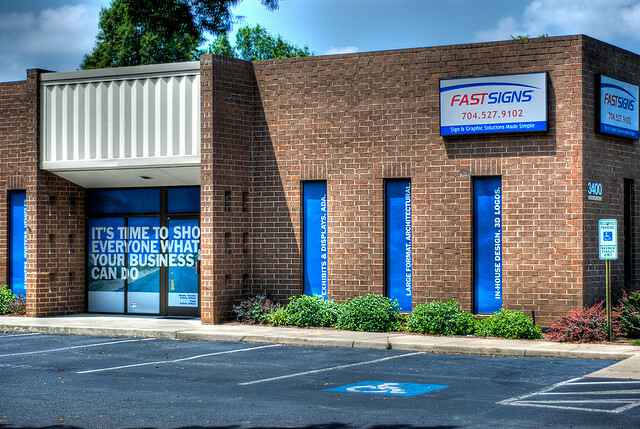 The first FASTSIGNS store was an immediate success and with many people interested in what Salomon and Schnanbaum were doing, they opened two additional stores. After this, Salomon and Schnanbaum started franchising the FASTSIGNS concept in late 1986. 14. FASTSIGNS grew quickly and within 5 years, the company had over 150 locations. In 1991, FASTSIGNS sold its first international franchise in the UK. Throughout the rest of the 1990s, FASTSIGNS continued to grow both domestically and internationally. 15. In 2003, Roark Capital Group, an Atlanta-based private equity firm, acquired FASTSIGNS. A few years later, in 2008, Salomon announced that he was retiring from the company (Schnanbaum had already passed away) and Catherine Monson stepped in as CEO and president, a position she still holds today. 16. In 2014, FASTSIGNS was sold again and purchased by Levine Leichtman Capital Partners, a Beverly Hills-based investment firm. In early March 2019, FASTSIGNS International, Inc. was acquired by LightBay Capital, Freeman Spogli & Co., and the company’s management. Today, FASTSIGNS has locations across the United States, Canada, the UK, the Cayman Islands, Mexico, the UAE, Saudi Arabia, Chile, and Australia (operated under the name Signwave). 17. FASTSIGNS ranked No. 95 on Entrepreneur’s 2019 Franchise 500 list. Please click here for detailed estimates of FASTSIGNS franchise costs, based on Item 7 of the company’s 2018 FDD. Please click here for detailed information on FASTSIGNS’ initial franchise fee, royalty fee, marketing fee, and other fees, based on Items 5 and 6 of the company’s 2018 FDD. On December 31, 2017, there were 676 FASTSIGNS Centers open and in operation, of which 73 were international. 564 FASTSIGNS Centers were open and 560 were in continuous operation in the United States during the entire calendar year ending December 31, 2017. The analysis set forth below is based on the average yearly gross sales and median sales for those 560 FASTSIGNS Centers for 2017. Of the 560 FASTSIGNS Centers open and in continuous operation in the United Slates during the entire calendar year ending December 31, 2017, 515 FASTSIGNS Centers were “Full-Service” Centers, 20 FASTSIGNS Centers were “Satellite” Centers, and 25 FASTSIGNS Centers were “Co-Brand” Centers. A “Full-Service” Center is the FASTSIGNS Center that the franchisor typically offers under the Franchise Disclosure Document. It includes production equipment and is a stand-alone business. A “Satellite” Center is a FASTSIGNS Center without any production equipment and is owned by a franchisee who also owns a Full-Service FASTSIGNS Center. The franchisor no longer offers Satellite Centers for sale. A “Co-Brand” Center is an existing operating complementary business that establishes and operates a FASTSIGNS Center within that business. The following Tables refer to “Gross Sales.” “Gross Sales” includes cash and credit sales as well as any goods or services received by the franchisee in exchange for goods and services sold at the FASTSIGNS Center. “Gross Sales” does not include sales or use taxes. The following Table provides systemwide Gross Sales for all operational FASTSIGNS Centers reporting sales for the full twelve months and the Gross Sales for Full-Service Centers.